Welcome to my visual diary of the beautiful, and rare, birds I photographed during the fall and winter months. I was so blessed to photograph many rare bird for the Los Angeles area, such as a Orchard Oriole, Scott's Oriole, Tropical Kingbird, Red-throated Loon, White-throated Sparrow, Williamson's Sapsucker, Ross's Goose, Cackling Goose, Blue-footed Booby, Summer Tanager and a Eurasian Wigeon. It was an exciting time! 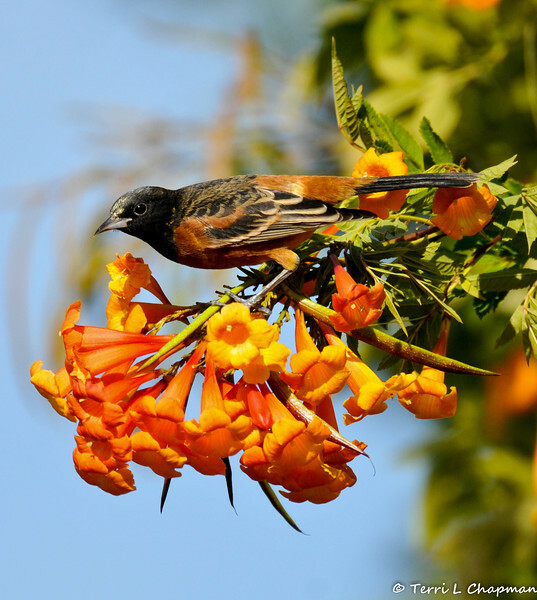 This image of a male Orchard Oriole, perched on Orange Trumpet Flowers, was featured in the 2017 Spring edition of "Birds & Bloom" magazine. This oriole is the smallest of North America’s orioles and winters in Mexico, Central America and South America. Thus, this lone bird is considered a rare bird sighting for the Los Angeles area.